Email marketing vs. Bulk SMS marketing, one of the most debated mobile marketing topics. Nowadays though, a brand can’t just communicate with their customers through one channel. Email has been a frustration for business professionals and small business owners for decades. The endless pile of messages in our inboxes, and the constant battle of deciding what deserves our attention, paired with the latest click-through rates of 4.19%, recorded in 2017. Email remains a mainstay of mass marketing communications. Over the years, it’s cemented as a necessity for ever type of marketing. Attracted by its low cost, a typical email campaign cost €5 per 1,000 emails sent. But it’s the bigger picture that businesses often overlook or are unaware of. The volume of businesses using email is astronomical, making the marketing platform extremely cluttered. Bulk SMS campaigns have increasingly become a quick, cost-effective marketing platform. Their high open and response rates compared to email marketing has made them the ideal choice for large companies and political campaigns alike, who have leveraged SMS to get their message across and garner an audience. Mobile has created an ‘always on’ marketing landscape, leaving SMS and email marketing tussling for our attention. Both channels enable businesses to send out timely information and exclusive offers at mass. 60% of people around the world own a mobile phone compared with 40% who have access to the internet. Statistics show that the number of mobile phone users has increased 4% every year since 2013. Meaning the potential number of people reached through SMS is much greater than through email. Pew Research Centre found that 91% of Americans have a mobile phone that is text ready. The availability of text messaging is part of its power. Most people with a mobile device are within arm’s reach of their phones 24 hours a day. 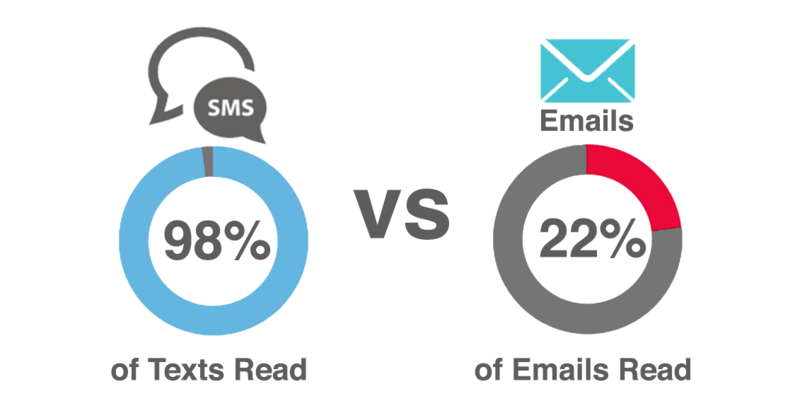 Research has found that 98% of SMS messages have a response rate of 45% while, as of 2017, open rates for emails are now 22% with a much lower response rate of 6%. This means that more 3 times the people are reading your messages than opening your emails. Quality over quantity. With an industry-standard of 160 characters, text messages are short and can be read in seconds. This makes the impression that a business wants, but it doesn’t carry the burden of the viewer having to wade through a wall of text messages. Text messages fit perfectly into how people are consuming information. The brief nature of text messages allows for easier consumption. It’s easy to read, respond, or handle 20-30 messages per day. It’s light and more interactive than email, so it keeps the attention. 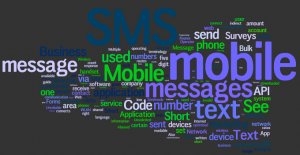 SMS marketing eliminates the burden of email. SMS is about creating action. Text messages make an impression because of the format and the speed. A well—crafted SMS, sent at the right time, with an appropriate call-to-action creates customer engagement. Build your strategy around attention. Figure out where that attention is, deploy your strategy and convert that strategy into leads. And in 2017 everyone’s attention is on their smartphone, making SMS the perfect avenue for any business big or small. Many companies are integrating bulk sms into their email campaigns. With SMS open rates at 98% within the first three minutes of delivery, they have realised the importance of boosting email open rates, and, ultimately, conversion rates, by incorporating SMS marketing. Including URLs promotes website traffic and encourages subscriptions. Total customer views are improved and companies can track customer activity back to SMS. These companies are driven by short codes and keywords and need to be clear and beneficial to the recipient. Companies need to think of new ideas and keep up with trends to keep their customer’s engaged. Think about your email inbox right now: how many notifications will be glaring at you? As you delve further, no doubt there’ll be emails you immediately delete every time? With SMS open rates as high as they are at the end of 2017, you can almost guarantee that your message will be read instantly with an SMS campaign.SMS is much more personal and receiving one from a brand feels similar to receiving one from a friend or family member. For more information on Bulk SMS visit Sendmode. We’d be happy to help. Thanks for taking the time to read this blog. We hope you enjoyed it.